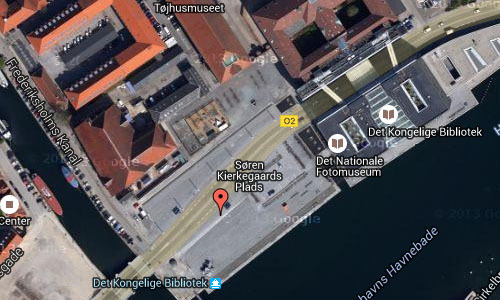 Søren Kierkegaards Plads is a harbourside public square on Slotsholmen in central Copenhagen, Denmark. 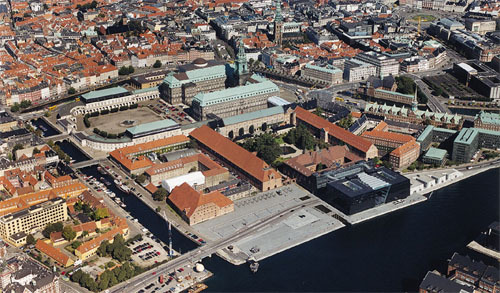 It occupies a strip of waterfront between the Black Diamond, whose main entrance faces the square, and the Frederiksholm Canal. 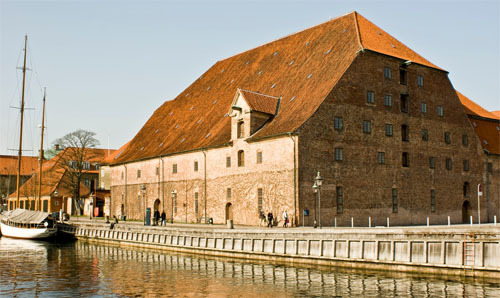 Away from the water, the square is faced by Christian IV’s Brewhouse as well as his old arsenal, now housing the Royal Military Museum. The thoroughfare Christians Brygge runs through the square which is connected to the water by “ghats” which also serve as seating for spectators for the occasional performances on a floating stage in the harbour basin. It was laid out in 1999 in connection with the construction of the adjacent Black Diamond. 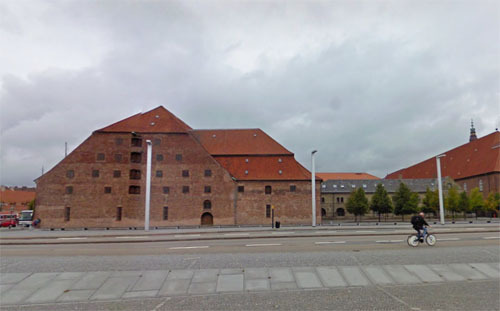 The large brickstone building is Christian IV’s Brewhouse (Danish: Christian IV’s Bryghus), dating from 1608. In spite of the name under which it is known today, the building was not originally built for the purpose of brewing beer. It is located on Slotsholmen by the harbourfront and was constructed for military purposes as a corner bastion, part of Christian IV’s fortification of the city. In 1443, Christopher of Bavaria established a brewery at Copenhagen Castle. It was called Kongens Bryghus (English: The King’s Brewhouse), and supplied beer for the king’s own household and the Royal Court. 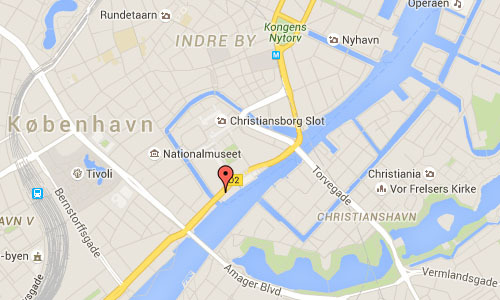 Production was expanded with another brewery, located at the end of Østergade, which burned down in 1540. A new Brewhose was built at Slotsholmen, supplying beer until yet another fire devastated the building. Christian IV’s Brewhouse was built for defensive purposes, part of his fortification of the city. Already eight years later, the building had lost its military significance due to the construction of the artificial island Christianshavn with its extensive system of ramparts and bastions. Upon royal order, the building was then taken into use by Kongens Bryghus. 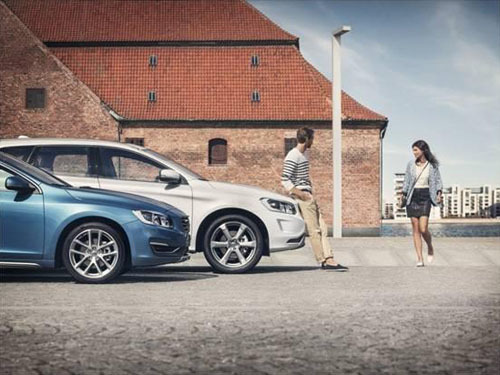 For this purpose the building was capped with a high shale roof with steep gables over the massive walls. In 1923, Kongens Bryghus moved to new premises, while the old buildings were used as a warehouse until 1960 when it burned down. The site, located next to Christian IV’s Brewhose, is still known as Bryghusgrunden (English: The Brewhouse Site). It has remained undeveloped, though the Realdania Foundation has plans to build a mixed-use property designed by Rem Koolhaas on the lot. More information on en.wikipedia.org, www.e-architect.co.uk and www.visitcopenhagen.com.